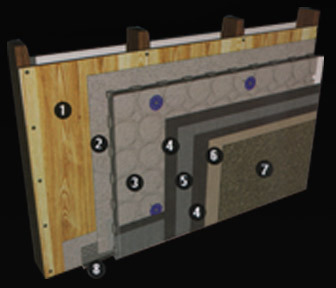 Pressure Utilized Compartmented Cavity System is the first Extreior Insulated Finish System in Canada to receive a building code recognized CCMC evalution for use over wood sheathing. This innovative addition to the DuRock product line provides the ultimate in moisture control, durability and product performance. DuROCK's "Polar Bear" moisture barrier/adhesive which is formulated to bond to wood sheathing, forming a secondary barrier against moisture intrusion. DuROCK's PATENTED circular drainage system which allows moisture to exfiltrate the system through the base of the wall or at joints. DuROCK's PATENTED drainage track that collects water and facilitates air pressure moderation. DuROCK Alfacing International is a Canadian business that taked pride in providing its customers with high quality interior and exterior finishing systems. The company’s broad range of products and systems are subjected to extensive research and rigorous testing to withstand the most extreme environmental conditions. DuROCK's state-of-the-art facility in Woodbridge, Ontario, Canada is one of the largest of its kind in the industry and can manufacture products in record time, under strict quality control. In recent decades, architectural polymer coatings have revolutionized the concept of stucco veneer on building exteriors; most evident with the application of polymer based stucco overtop insulation providing a thermally efficent and crack resistant cladding. The growing popularity of EIFS can be attributed to its superior energy efficiency, flexibility of texture and design, with an unlimited color selection. Architectural Detialing is more cost effective with EIFS; such as cornices, arches, columns, keystones, and decorative accents. Although EIFS has notable popularity, conventional cement plasters have adopted the use of ploymer based finish coatings due to the improved color fastness, flexibility and consistency. DuROCK’s polymer stucco systems enable builders and architects to create a striking, distinctive appearance to any building or residence. Jewel Stone can transform everyday concrete surfaces into beautiful decorative faux stone finishes. Jewel Stone can be used to restore and beautify old deteriorating concrete or be the finishing touch on new concrete surfaces. It is ideal for walkways, terrances, patios, pool areas, or recreational flooring that requires the look and performance of stone with the flexibility of polymer modifiers, thus enabling the resurfacing of cement tile, linoleum, or as the finished surface of DuRock EIFS or stucco. Jewel Stone and Jewel Stone Plus are adaptable for a host of specailty and custom finish applications. DuROCK’s collection of specialty interior design finishes can turn an ordinary wall into an extraordinary work of art. DuRMAR Vebetian Plaster is reminiscent of the old italian classic finish, but with a polised marble appearance. DuROCK’s other specialty finishes include Spacco, Crystal Coat, Indiana Limestone, Angelstone & Gemstone. The variety of colors and textures available from DuROCK are virtually endless...All of which can be fully customized for the most discerning designers and owners... All DuROCK finishes are environmentally friendly and available in thousands of colors.